We are absolutely delighted to announce that North Bridge House Senior School’s Head of Modern Foreign Languages, Lara Boyer, has been named Secondary Years Teacher of the Year at the Cognita Awards for Excellence 2015. 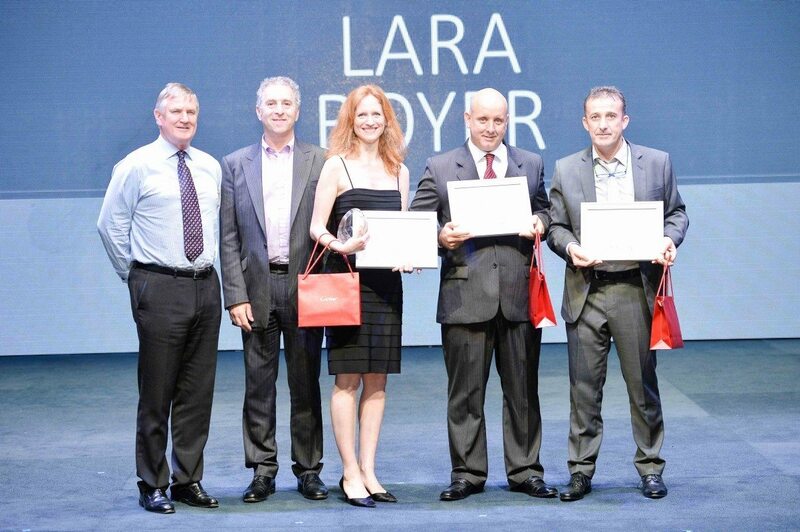 Across 66 international schools, Lara was recognised for being a highly respected and dedicated member of staff and for her outstanding contribution to helping to pupils to achieve their full potential. ‘Miss Boyer’s passion for the language is contagious and she works hard to make sure pupils of all abilities feel included, able and equally as passionate. We spoke to Lara about winning the global award and her successful time at North Bridge House. How does it feel to win this award in your 10th year at North Bridge House? Absolutely amazing! I’ve worked incredibly hard over the last ten years and to have been recognised for my commitment and dedication is exceedingly rewarding. The timing couldn’t have been better, of course, as it marks my tenth year at NBH. I can’t thank my Head Teacher, Mrs Georgina Masefield, enough for her support in nominating me for the award. What was the award ceremony in Singapore like? I feel very privileged to have experienced such a special event. It felt like the Oscars! The ceremony took place at Stanford American International School, Cognita’s flagship school in Asia, with over 300 guests. For each category (Early Years, Primary, Secondary, Learning Support and Non-Teaching), finalists from each of the three regions, Europe, Asia and Latin America, were invited up onto the stage. We were congratulated by Cognita’s Chief Executive, Rees Withers, and Chairman, Ralph Kugler, for having won our regional award. Then the chief executive opened an envelope to announce the global winner. It was both terrifying and exhilarating! What else did the trip to Singapore involve? On our first day, we were taken on a catamaran trip around the Southern islands of Singapore with views of the city skyline. It was an ideal opportunity to meet the other finalists and acclimatise to being on the other side of the world, having just flown in that morning. On the following day, we spent the morning at Stanford American International School, where we were given a tour and received a CPD session by Microsoft on the use of ICT in the classroom. We were then given a guided tour of the National Museum of Singapore followed by a visit to Raffles Hotel, where we were treated to the famous Singapore Sling. The awards ceremony took place later that evening. The weekend was then our own to visit, discover and savour as much of Singapore as possible. Is there anything that you will take forward from the experience? It has given me an insight into international teaching and how diverse our schools are within the group, as well as having been highly motivational. Why do you think MFL is popular at North Bridge House Senior School? Our MFL teachers are experienced and their expectations are high. Lessons are engaging and varied, and differentiated to allow pupils of all abilities to make progress and meet their potential; our trips are very popular, as we offer our pupils opportunities for language immersion in France and Spain. Although learning languages can be challenging, we want our students’ language experience at school to be a positive one. How do you maintain an effective teaching approach after ten years of working at the school? I’m a great advocate for sharing ideas and working within a collegial and cohesive team. Sharing best practice allows us as classroom practitioners to develop our skills however experienced we may be. I have always been driven in my work, never allowing myself to become complacent. I have high expectations of myself, strive for excellence and I am passionate about teaching languages. What do you enjoy most about teaching at North Bridge House? The pupils and the staff. Our pupils are engaging, respectful and inquisitive and their families are very supportive. I’m also fortunate to work with such highly supportive colleagues. How do you inspire students to think about languages beyond the classroom and consider pursuing them in higher education / their future careers? I endeavour to inspire my students through my passion for languages and other cultures. I often share my own experiences of living and travelling abroad with my students, as a means of bringing the importance of languages to life. Growing up bilingual (French and English) and having lived in francophone West Africa, as well as the US, languages and a respect for cultural diversity have always played a central role in my life.